Hotel check-in and free day. (if you wish to arrive to Stockholm earlier we will be happy to book your hotel and sightseeing). Breakfast buffet at the hotel. 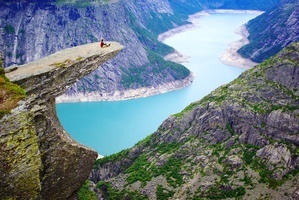 Morning cruise on the UNESCO-listed Geiranger Fjord with the impressive waterfalls ”the Bridal Veil” and “the Seven Sisters”. Continue to Briksdal Glacier. The last part of the journey up to the glacier will be in the motorized open Troll Cars, allowing you to enjoy the full panoramic view. 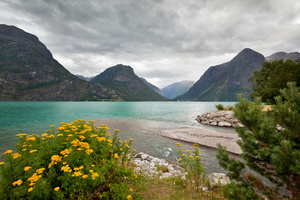 After the glacier experience, sit back in the coach and enjoy the views of mountains and fjords passing by as we drive towards Balestrand. Our route will take us through the Gaular Mountain National Park. Breakfast buffet at the hotel. Ferry across to Hella and continue along the scenic coastal route to Manheller for a short ferry crossing to Fodnes. We then continue to Gudvangen, where we board a 2 hour mini-cruise of the Sogne Fjord, the longest and deepest fjord in the world. Marvel at the landscape as we sail into the Nærøy fjord – a UNESCO World Heritage Site, with small farms scattered on the steep hillsides of the fjord, cascading waterfalls and towering snow-clad mountains. Breakfast buffet at the hotel. Orientation tour of Bergen, taking us to the famous open air fish market, stroll across to Bryggen where the traditional wooden medieval buildings still remain as in the times of the Hanseatic League. Time at leisure for shopping, having lunch and maybe taking the funicular to the top of Mount Fløyen for a stunning view of Bergen. In the early afternoon we continue towards the Hardanger Fjord with its romantic landscape of fruit orchards and rounded mountains. We make a stop at the impressive Vøringsfoss waterfall with a vertical drop of 180 meters, before ascending the Hardanger Mountain Plateau, before reaching the Geilo area. Dinner and overnight at Storefjell Resort or similar. This morning we head for Oslo, the capital of Norway, with arrival around noon. 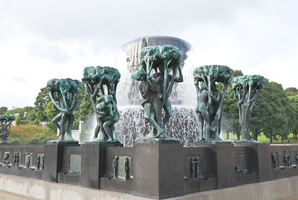 Some free time for lunch before going on the guided tour of Oslo, which takes you to the Frogner Park with the controversial sculptures of the famous Norwegian Gustav Vigeland. Other highlights of the tour area the Royal Palace, the medieval fortress Akershus, the modern Opera house, the City Hall etc. 7 overnights at the hotel mentioned in the itinerary or similar category (4 star Hotels) with Scandinavian breakfast buffet. 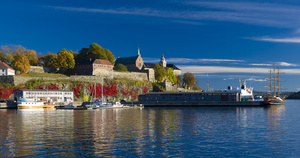 City tours of Oslo with local English-speaking guides. 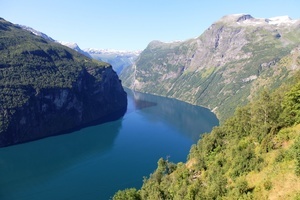 2 Mini cruises on the Norwegian fjords of Geiranger Fjord and Nærøy Fjord – Sogne Fjord. Scenic rail road trip with Flam Railway.